The flu has ravaged the country this winter. People are dropping like flies, as this year’s flu shot has proven less effective as a variety of flu strains have circulated. It’s hit several people throughout Banyan Hill already this year and appears to have knocked out our own Joseph Hargett. That’s why I’m filling in for him this Friday. Today, the Centers for Disease Control and Prevention announced that for the first time in its 13 years of monitoring the flu, the continental U.S. has shown “widespread” flu activity. The impact of this flu season could cost employers more than $9.4 billion in lost productivity, according to Challenger, Gray & Christmas. Nobody likes to make a budget and actually stick to it. Washington is certainly no different. But agreed upon funds to keep the government’s lights on run out at midnight tonight. While the House of Representatives pushed through a one-month stopgap measure on Thursday, the chances of it passing the Senate are looking pretty grim. The potential for a partial government shutdown is looking strong. And even a brief shutdown could add uncertainty to the market. Since 1976, there have been 18 government shutdowns, and only 44% of those saw the market close higher during that time frame. On average, the market has fallen 0.6%. And you’re right. A 0.6% drop really is … well, just a drop in the bucket. But let’s consider the market’s recent run. The S&P 500 has gone 394 days without a 5% drawdown, according to Goldman Sachs. That’s tying the longest stretch in the market’s history. We’re facing an overstretched market, and it’s looking for an excuse to let off a little steam in the form of a pullback. Under normal circumstances, a brief government shutdown wouldn’t have much of an impact. But we’re not trading under normal circumstances. Washington turmoil could be used as an easy excuse to take some profits off the table, sending stocks sharply lower. However, there is one standout this year that could easily weather a government shutdown and a stock market sell-off. Gold has enjoyed a stellar rally. After putting in a short-term bottom on December 12 at $1,238.30, the yellow metal has rallied 7.7%. Gold is a favorite among investors during times of turmoil and uncertainty. 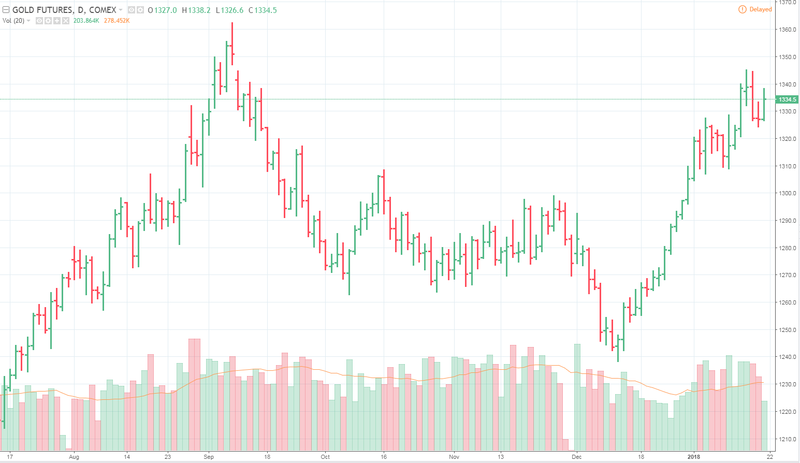 And our natural resources expert, Matt Badiali, believes that gold is in the early stages of a bull market that will see the precious metal climb significantly higher over the next several months. In fact, he’s digging up some great mining companies that are poised to rake in some massive profits from the rally in gold. Gold has surprisingly outperformed the broad market over the past month, and it’s likely to maintain that uptrend through a potential pullback in stocks. You can leverage those golden gains through mining companies that are set to announce solid earnings on the strength in gold’s price. To learn what you can do, check out Matt’s upcoming Front Line Profits Summit. Now is a great time to add a little gold to your portfolio. P.S. No other natural resource analyst has the breadth of contacts and information or the gritty hands-on field experience as Matt Badiali. Nor have they delivered the kinds of results Matt has, such as 251% with Silvercorp Metals … 321% on Jinshan Gold Mines … 342% from Silver Wheaton … the list goes on and on. However, as rewarding as gains like these were, Matt was determined to do even better. So he developed an even bolder strategy — one that identifies resource stocks that are poised to climb as much as 1,000%. To learn the secrets behind Matt’s groundbreaking new strategy, click here now to sign up for his exclusive webinar presentation.